"Riveting and enjoyable reading... A powerful story." 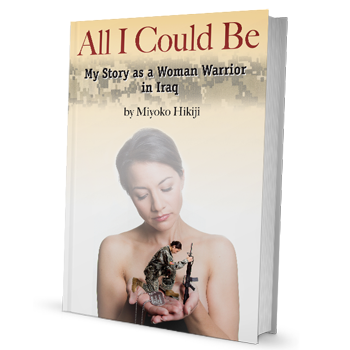 Miyoko Hikiji served as an enlisted soldier in the Army and Iowa Army National Guard for nearly a decade, spending 400 days deployed for Operation Iraqi Freedom in 2003—2004. Her job duties included truck driver, unit correspondent and administrative sergeant. During the deployment she spent over 70 days running supply convoy, security and raid missions throughout the northwest quadrant of Iraq. Simultaneously, Miyoko wrote a company newsletter, contributed to her support squadron’s newsletter, wrote articles for a hometown newspaper and updates for the unit’s family support group in Iowa. Upon her return from Iraq, Miyoko wrote her company’s deployment history for the archives at the Gold Star Museum on Camp Dodge — the Iowa Army and Air National Guard State Headquarters. She lives in Urbandale, Iowa with her two daughters. Published in May of 2013 by History Publishing Co.